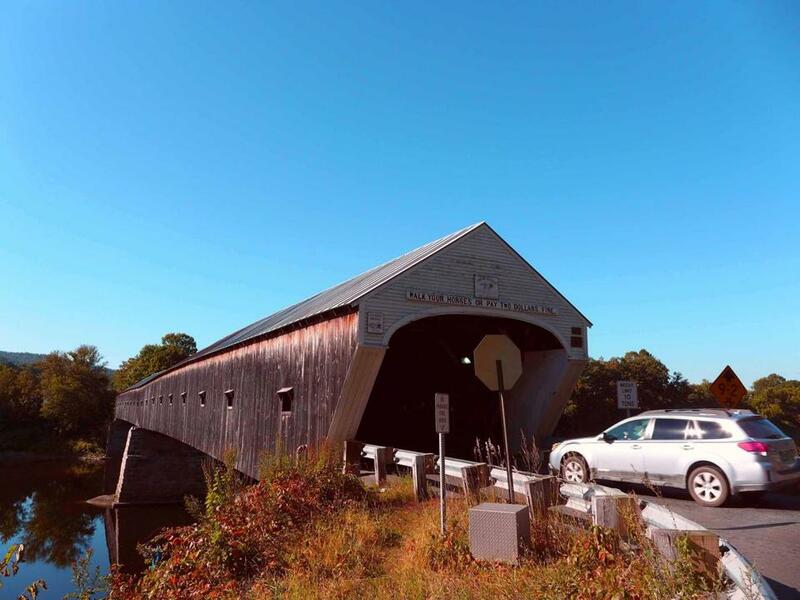 The Cornish-Windsor covered bridge near Hanover, New Hampshire, is the longest in New England. Only a footprint wide in places, the international boundary trail in Pittsburg, New Hampshire, vacillates between the United States and Canada on the initial half-mile climb over rocky outcrops. Our clothes are drenched from contending with thigh-high ferns and raspberry brambles when we begin a short descent through hemlock forest to Fourth Connecticut Lake, in far northern New Hampshire, where the Connecticut River begins its 410-mile journey to Long Island Sound. A loop trail circles the boggy waters where the source of the Connecticut shifts according to the whims of local beavers. Wild orchids sprout from spongy sphagnum moss where beaver-cut brush has reduced one of two outlets to a trickle. Fifty yards away, a brook gurgles over flat slates and we cross the source of the mighty Connecticut in two quick hops. This year, we decided to follow New England’s longest river from source to sea. Back at our car at the US border crossing, we begin the journey. The first leg is short — 14 miles along “Moose Alley” (actually Route 3) past the “haunted house” atop Corkscrew Hill to our cabin overlooking First Connecticut Lake. Before it runs free south of Pittsburg, the river stutters at four lakes ranked as some of New England’s finest trout waters. 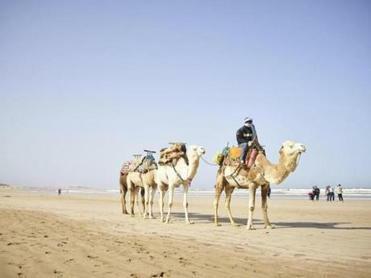 The next day we rise with the fishermen. As we drive south in the early morning light, a tube of mist writhes on the river’s surface above fast-running water. The sun inches up in the sky and the moment passes. This northern stretch, which soon forms the border between New Hampshire and Vermont, is the closest the Connecticut comes to a wild river. We’re playing peekaboo through the trees. Now we see the river, now we don’t. At points the young Connecticut is swift but so narrow we could jump it on mountain bikes. One of the few big towns in the North Country, Colebrook, New Hampshire, is home to Le Rendez Vous (603-237-5150, lerendezvousbakerynh.com), a great French bakery. In the 19th century, Colebrook milled potato starch for making potato whiskey. And since the river widens here, timber barons flooded the Connecticut with log drives in the years before World War I. Now the carcasses of big pine and spruce shuttle through on lumber trucks. A short distance south, a covered bridge weds Columbia, New Hampshire, to Lemington, Vermont. Driving through to state Route 102, we now look over the river toward a backdrop of the White Mountains. But it’s hard to resist covered bridges. Another connecting Lunenburg, Vermont, and Lancaster, New Hampshire, lets us cross back over for the alternate view of Vermont’s hillside pastures spattered with black and white cows. As the river gains tributaries, croplands on its banks expand. At Robie Farm (603-272-4872, robiefarmnh.com) in Piermont, New Hampshire, sixth-generation dairy farmers sell raw milk, beef, pork, poultry, and several small-batch cheeses. It also supplies more than 50 restaurants and markets in the Upper Valley. The Trust for Public Land and funds from the Granite State’s moose license plates helped conserve this property for agriculture. We leave with Toma cheese and free-range eggs in our ice-packed cooler. Just south, in Orford, the high rocky banks rising above the river on the Vermont side evoke the castle-covered upper Rhine. At the Saint-Gaudens National Historic Site (603-675-2175, nps.gov/saga) in Cornish, New Hampshire, the summer home and studio of one of America’s greatest sculptors commands a sweeping view of the valley. The art colony that coalesced around Augustus Saint-Gaudens was a circa-1900 who’s who in American art. It’s fun to imagine Maxfield Parrish, Frederic Remington, and dancer Isadora Duncan playing lawn bowls as they rusticated along the river. Curtis Tuff of Curtis’ BBQ in Putney, Vermont, tends to ribs. Go south from Charlestown, where the re-created Fort at No. 4 (603-826-5700, fortat4.org) recalls the frontier days of the French and Indian War, and the river towns show an increasing sophistication beneath their rustic veneers. Walpole is the slyest of all. Ken Burns’s Florentine Films operates not far from the original L.A. Burdick chocolate shop (603-756-2882, burdickchocolate.com). Nearby Alyson’s Orchard (603-756-9800, alysonsorchard.com) — with an extensive pick-your-own operation — was a pioneer in New England’s heirloom apple renaissance. 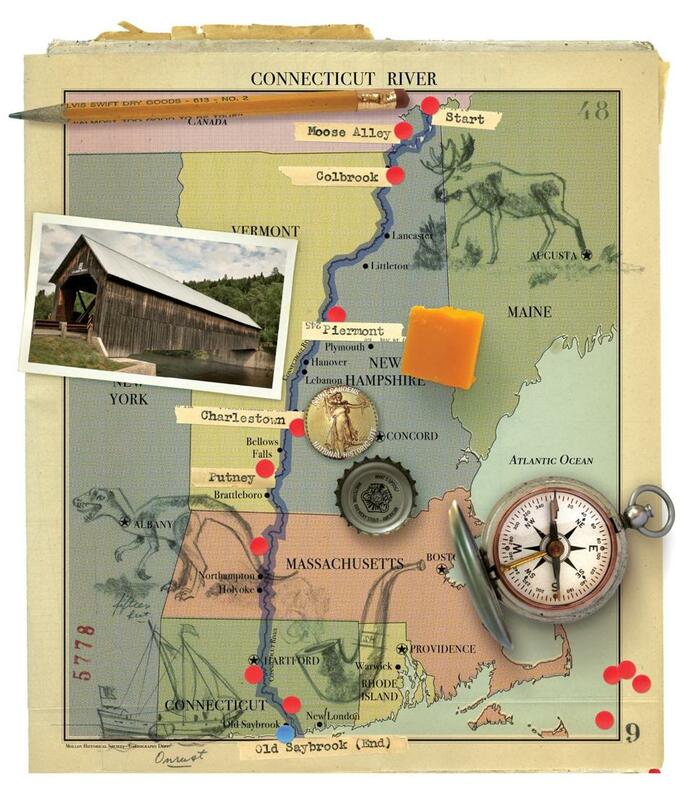 We cross the river back to Vermont to drive the high bank along Route 5 to Curtis’ BBQ in Putney (802-387-5474). 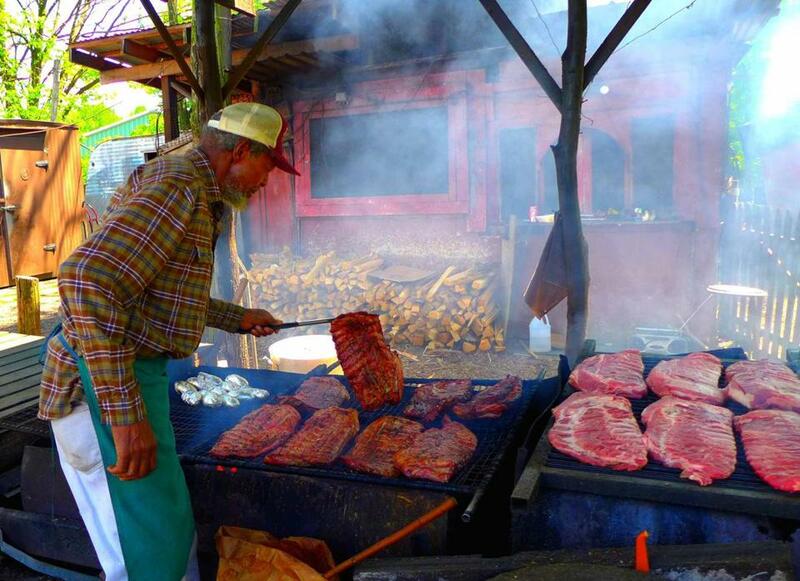 Since 1968, Curtis Tuff has been barbecuing pork and chicken over hardwood fires in big steel drums. 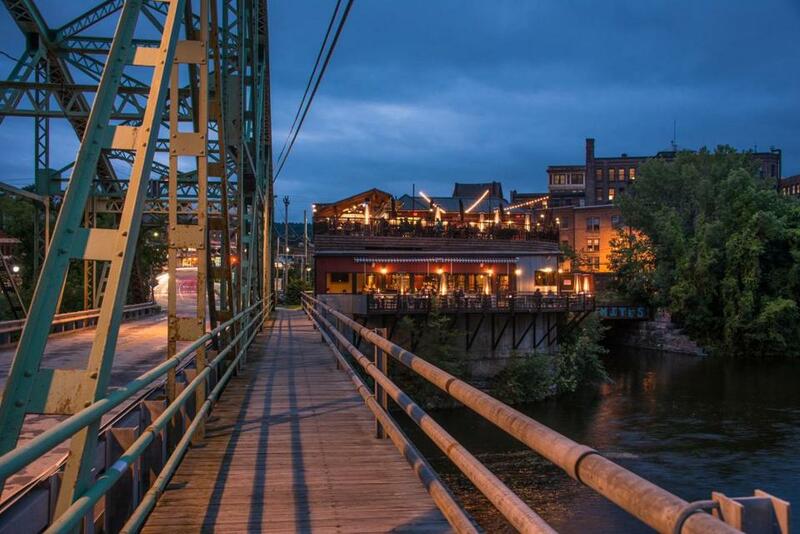 In hipster Brattleboro, about 10 miles south, folks with ironic beards and artistic tattoos crowd into Whetstone Station Restaurant and Brewery (802-490-2354, whetstonestation.com) a cozy joint up against the Vermont side of the Hinsdale Bridge. A dotted line drawn on the floor of the dining room marks the boundary between the two states. By the time we reach Turners Falls, in the town of Montague, Massachusetts, two-thirds of the Connecticut River is behind us. Just over the Turners Falls-Gill Bridge, the Great Falls Discovery Center (413-863-3221, greatfallsdiscoverycenter.org) links the geology, history, and environmental science of the watershed. Behind the center, the churning waters of the 2.1-mile power canal generate enough electricity to light 10,000 homes. It’s just one of several small hydroelectric projects on the Connecticut. The Whetstone Station Restaurant and Brewery on the Vermont end of the Hinsdale Bridge. Now the river unfolds with unhurried majesty as it rolls through the agricultural floodplain of the Pioneer Valley. Thousands of years of spring flooding have deposited some of the richest soil in the Northeast. Echoing the practicality of the early settlers, most of the 18-mile stretch of state Route 47 between Sunderland and South Hadley is simply called River Road. In summer, you can practically hear the crops grow. Autumn farm stands along this section overflow like cornucopia. The Teddy C. Smiarowski III Farmstand & Creamy (413-665-3830) harvests squash, pumpkins, onions, beets, and giant heads of cabbage that Smiarowski’s Polish-American neighbors use for making meat-stuffed cabbage rolls, or golumpki. (The Polish Plate from the farm stand’s kitchen features golumpki, kielbasa, rye bread, and two sides.) Weathered old tobacco barns are a reminder that this bottomland once yielded some of the world’s finest cigar wrappers. River Road marks the southern end of the Connecticut River National Scenic Byway, which extends from the headwaters to South Hadley. The river roads become more disjointed south of the official byway, but the river itself is just working up a head of steam in its rush to the sea. Beguiling as the farm country is, stopping our journey here would be like binge reading the Harry Potter books but skipping The Deathly Hallows. Saint-Gaudens was hardly the only artist drawn to the river. In 1836, Thomas Cole painted the piece known as The Oxbow from the 935-foot summit of Mount Holyoke, in what is now known as Skinner State Park. Cole took a few liberties, tilting the river’s loop to make it more prominent and exaggerating nearby mountains. Moreover, the sinuous oxbow itself was closed off from the river by a flood a few years later. But it’s still a heck of view — all the more magnificent during the fall hawk migration that peaks around Columbus Day but stretches into November. Unfortunately, modern highways largely obliterate the best Massachusetts river views south of Holyoke, but just over the border into Connecticut, rural roads follow both banks down to Windsor Locks. Still 56 miles from Long Island Sound, the river begins to heed the pull of ocean tides. But the water remains fresh and sweet well south of Hartford. Wethersfield, founded in 1634, claims to be the first permanent settlement in Connecticut and still boasts more than 50 pre-Revolution homes. Local growers bred the Wethersfield red onion. One of two great 19th-century seed companies, Comstock Ferre & Co. (860-257-2790, heirloommkt.com), still welcomes droves of gardeners to its old barns. Nearby Rocky Hill marks a literal turning point in the Connecticut River. Roughly 12,400 years ago, the meltwater of what scientists call Lake Hitchcock burst its dam of glacial rubble in Rocky Hill. The long-contained waters left the rift valley and cut a new path southeast, creating one of the most scenic stretches of the river. The high bluffs at East Haddam almost cry out for a castle. In 1919, William Gillette, known for his stage portrayals of Sherlock Holmes, obliged when he finished building his fantasy citadel on the southernmost of seven hilltops. Restored by the state of Connecticut, it is the centerpiece of Gillette Castle State Park (860-526-2336, ct.gov). The view from the grounds provides an almost Wagnerian perspective on the Connecticut River as it opens wide, anticipating the Atlantic Ocean. The Norwottuck Rail Trail cuts through some of the richest farm land of the Connecticut River Valley. The river finally meets the sea — and our four-day journey concludes — in the town of Old Saybrook, settled by the English in 1635. The lack of a deep anchorage means that the Connecticut is the only major river in the country without a large city at its mouth. And that’s the way we like it. After a lobster dinner, we walk along the waterfront and end as we began, among fishermen, as they cast for stripers by moonlight. 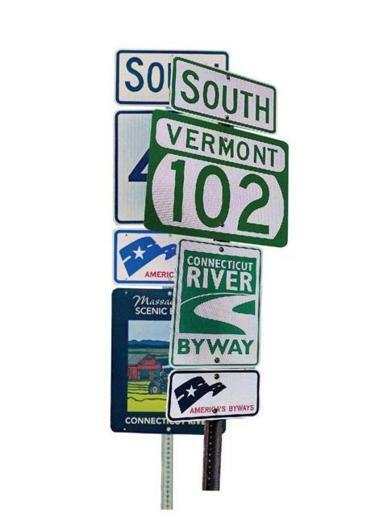 Bring detailed printed state road maps for this journey, as GPS often ignores the river roads. Suggested lodgings are spaced to allow time for exploration (and picture-taking) each day. Modernized cabins 14 miles south of the Canadian border cater to anglers, hunters, hikers, and snowmobilers. Many overlook First Connecticut Lake. Cabins from $110. Rooms split between cozy spots in the main inn and larger accommodations in two newer structures. Norwich is just across the river from Hanover, but more country than college. On-site microbrewery only sells its ales here. Rooms from $249. Historic structure on Mill River in Hatfield was converted to posh rooms and suites. Full gourmet breakfast features garden produce and eggs from the coop out back. Rooms from $159. With standard rooms starting at 490 square feet, this hotel, spa, and marina at the mouth of the Connecticut tends to attract the blazer and pocket-square set for luxurious overnights. Rooms from $229.